Ireneo Caruana Tabasa, 70, passed away Saturday, December 9, 2017 on a pilgrimage with wife, Delia, and friends, for the feast day of Our Lady of Guadalupe in Mexico. On the 2nd day, he collapsed in front of the Church of Santo Domingo in Puebla, Mexico. Ireneo was born June 28, 1947 in Cebu City, Philippines to Pascuala (Caruana) and Solomon Tabasa. He married Delia (Daclan) on May 4, 1974 at Archbishop's Palace Cebu and celebrated 43 years of marriage. Together they migrated to the US in September 1975, starting their new life in San Francisco, CA. Ireneo was a Mechanical Engineer for consulting firms in San Francisco. He was active in numerous religious, professional and community organizations throughout the San Francisco Bay Area. He served as Head Servant for the Amor Dei Charismatic Community of Northern California, as Grand Knight with the Knights of Columbus for the Our Lady of Visitacion Council in San Francisco, with the Filipino Catholic Charismatic Communities of the Archdiocese of San Francisco and with the Alliance of Filipino Catholic Charismatic Prayer Communities. He was President of the Cebu Institute Technology University (CIT) Alumni Association, Northern California chapter and co-founded the Bisayan Society, USA based in Fairfield, CA. He was preceded in death by his parents. He is survived by wife, Delia; children, Charlene and Kharl; son-inlaw, Kimo Rosenbaum, daughter-in-law, Jennel (Jacildo); granddaughters, Kaelen (17), Nyssa (10), Karis (7), Nyomi (6), Kamryn (4); and sisters, Ceferina Ceniza and Martha Ellis & family. (Delivered during the Funeral Mass in Mt. Carmel Parish, Fairfield, California). Good morning my brothers and sisters in the Lord. My name is Bob Canton. I'm presently serving as the National Coordinator for the Alliance of Filipino Catholic Charismatic Prayer Communities in North America. Our beloved Brod Irnie Tabasa served as the Vice National Coordinator for Funding and as a Financial Advisor to the National Coordinator until his demise last December. 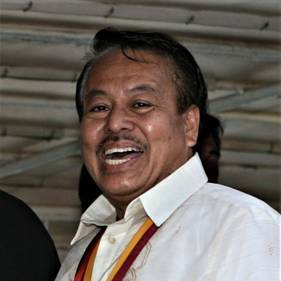 Brod Irnie also served as Head Servant Leader of the Amor Dei Prayer Community. His wife, Sis. Delia worked closely with him in the Amor Dei Prayer Community and also in the Alliance of Filipino Catholic Charismatic Prayer Communities. Sister Delia has been serving as the AFCCPC National Treasurer since the early 2000s. I could say, I know Brod Irnie well since the early 2000's since we had worked closely together in various AFCCPC events such as the National and Regional Conventions. I venture to say, that Brod Irnie was a lover. He was a lover of his family, a lover of his prayer community, a lover of the good things in life just like all of us, and most importantly a lover of the Lord and His works and His words. He was always enthusiastic about doing God's works. I remember vividly when he and Marico Enriquez worked tirelessly together during our AFCCPC Regional Conference in Stockton back in 2008. I told Brod Irnie and Marico that we needed funds badly for the Conference and one way to raise funds is probably through raffles, otherwise we would end up losing big money. Brod Irnie told me without a tinge of doubt in his voice "not to worry because we would not lose any money." He reminded me that the Lord will not allow us to be in want because we are doing His works. True enough, the AFCCPC was able to raise enough funds to cover all our Convention expenses plus we had some more extra money left for our next event. I saw how Bod Irnie together with Marico worked tirelessly for the success of the Conference. Brod Irnie was very resolute in accomplishing the tasks assigned to him, no matter how hard or seemingly impossible they might be. His beloved wife, Sis. Delia, told me recently that Brod Irnie was her eyes, her hands and feet in doing their tasks for the Lord. She said that Brod Irnie was a tremendous help to her in doing God's works. That's why I believe that Brod Irnie is much more alive now than he has ever been before, because he is now enjoying the reward that the Lord has prepared for him. I could just imagine the Lord Jesus telling Brod Irnie, "Well done my good and faithful servant. Come and inherit the Kingdom that my Father has prepared for you since the foundation of time." In 1 Cor. 15: 55 and 57, "Where, oh death is your victory, where oh death, is your sting? But thanks be to God! He gives us the victory through our Lord Jesus Christ." In the Book of Revelation 3:21, Jesus says, "I will grant the victor the right to sit with me on my throne as I sit down with my Father on His throne." I believe that Brod Irnie is now sitting down with Jesus on His throne right now. I believe further that he is now interceding for his family before the throne of God. That's why I don't doubt that many good things will happen to his family in days, and months, and years to come through his intercession. I know Brod Irnie. He will never give up until the Lord would say "Yes" to him. How about us, his friends? I believe that we will be more than OK also because Brod Irnie is also praying for us. Therefore, I urge you my brothers and sisters, to make his memory alive among us. How can we do this? By emulating his examples that he left for us to follow. Therefore, I urge you to be lovers too -- lovers of God, lovers of the truth, lovers of God's commands, lovers of His words, and lovers of the person next to you, no matter how unloveable that person maybe. Lastly, I would like for you to say this prayer with me, "Eternal rest grant unto Irnie, Oh Lord, and let your perpetual light shine upon him. May he rest in peace."